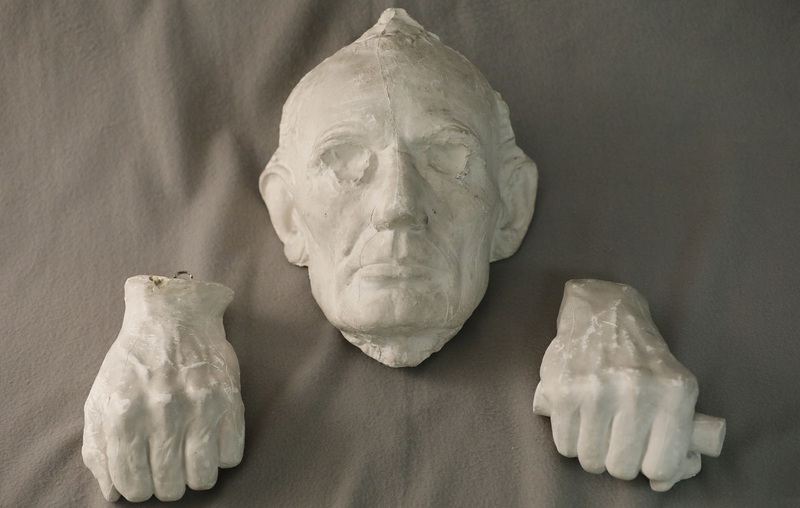 The plaster cast of Abraham Lincoln's face and hands at the Buffalo History Museum gives the 16th president a strangely disembodied appearance. Plaster of Paris life masks seem like an oddity today, but with photography still in its infancy, they were used in the mid-19th century to create a person's likeness. The rarely seen circa 1860 casts are among Lincoln artifacts at the Buffalo History Museum that over the years have become synonymous with him. "The life mask is just fascinating," said Anthony Greco, the museum's director of exhibits and interpretive planning. "They would have put layers of plaster over Lincoln's face, then additional layers one over the other until it had some stability to it." Lincoln's right hand clutches a wooden dowel, which Greco said was the result of swelling from shaking hands on the campaign trail. The plaster casts -- now stored with the rest of the Lincoln objects blocks away in a temperature-controlled room at the Buffalo Resource Center on Forest Avenue -- will be part of a pop-up exhibit of Lincoln artifacts at Kleinhans Music Hall on Thursday. 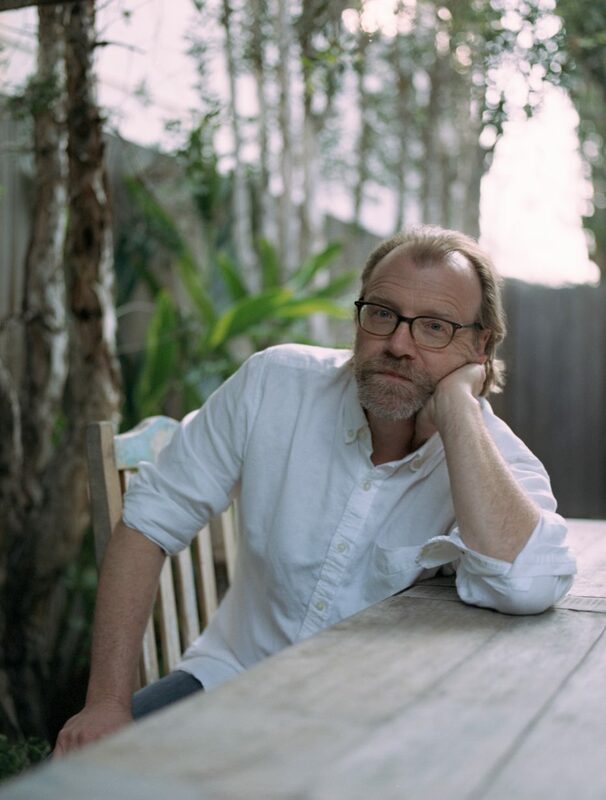 The display is a collaboration with the Babel literary series presenting George Saunders, author of the critically acclaimed "Lincoln in the Bardo." Lincoln, the president who kept the Union together as he steered the United States through the Civil War, and is regularly listed among the nation's three greatest presidents, is Saunders' favorite Oval Office holder. 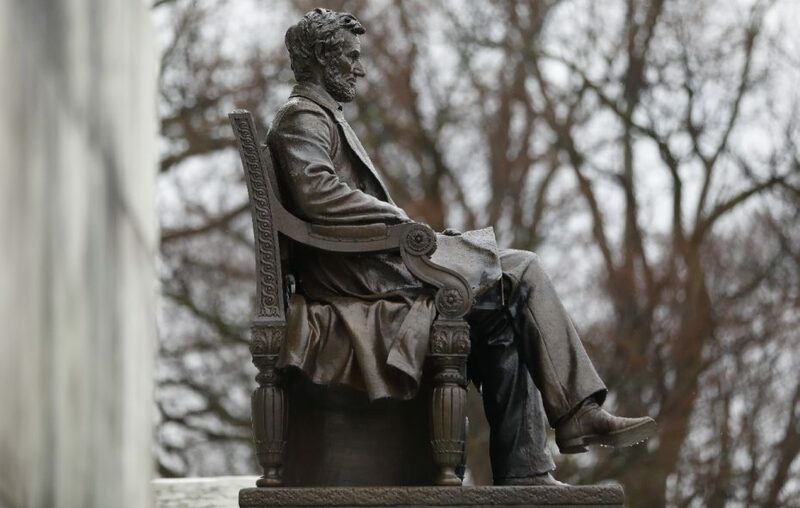 "I think so many people from different political camps can love Lincoln because the story of his presidency is so epic -- biblical, really," Saunders said. "I think everyone feels the nobility of his task," he said. "Yet when you research him, he was a real mess, and didn't have the moral clarity he later came to be known for. "Then he died and became Christ-like," Saunders said. Lincoln visited Buffalo three times. In 1848, he spent a night with his wife downtown while campaigning for a fellow Whig politician. In 1857, he stayed at the Cataract House in Niagara Falls with his wife and three sons. In 1861, Lincoln was received by a crowd estimated as large as 75,000 when he stopped in Buffalo on the way to his inauguration in Washington, D.C. The President-elect gave a speech Feb. 16, 1861 from the balcony of the American Hotel festooned with bunting. Beside him were former president Millard Fillmore, a newspaper editor, the acting mayor and a future Civil War hero. 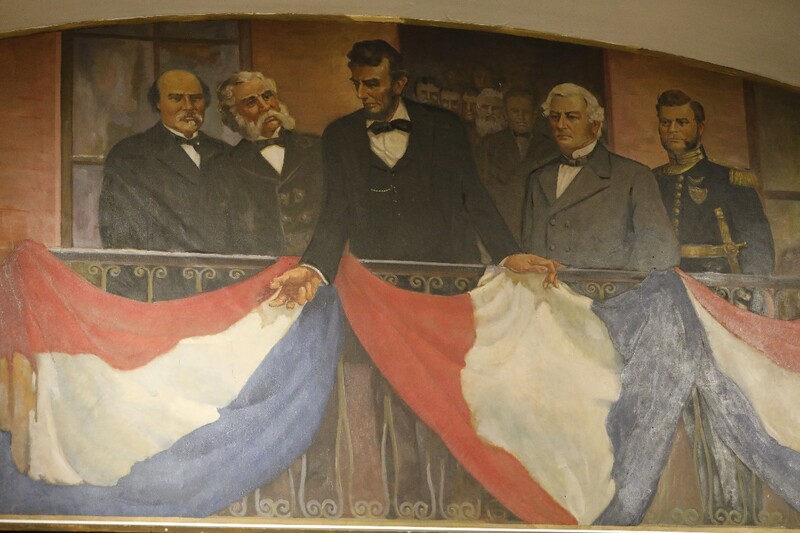 A mural on the second floor of the Buffalo History Museum painted during the Works Progress Administration in 1940 by artists Charles Grief and Edward Riegel shows Lincoln on that balcony. On that trip, Lincoln also stopped in Westfield and said hello to a girl who wrote him a letter suggesting he grow a beard. The Buffalo History Museum's identification with Lincoln had a lot to do with timing, Greco said. The museum was established in 1862, one year after Lincoln became president, and three years before he was assassinated. The Julius E. Francis collection was another factor. "The misnomer started with Francis, who called his collection the 'Memorial Lincoln Collection,'" said Walter Mayer, the museum's senior director of museum collections. The Julius Francis collection is more of a Civil War collection," he said. "That created a perception that the museum's collection is larger than it is." The sizable collection of artifacts collected by the Buffalo druggist includes a cane given to Lincoln in May 1862. There are more than 100 Lincoln campaign mementos in the collection, including a lithograph silk campaign ribbon featuring Lincoln's likeness, minus the beard, taken by Civil War photographer Mathew Brady. "The quality of the issue is really good," Mayer said, noting a tintype photograph was converted into the lithograph. The collection's real stock-in-trade, though, are autographs – lots of them. Large binders hold the names of some 10,322 soldiers and sailors with name, rank, enlistment and discharge dates. The important battles each participated in are also listed. Francis went to battlefield scenes to collect them. The collection also includes over 1, 500 autographs of government officials and a complete, two-volume set of Civil War envelopes used to mail letters, some with allegorical figures marked in watercolors. The Francis collection was donated to the museum in 1874. 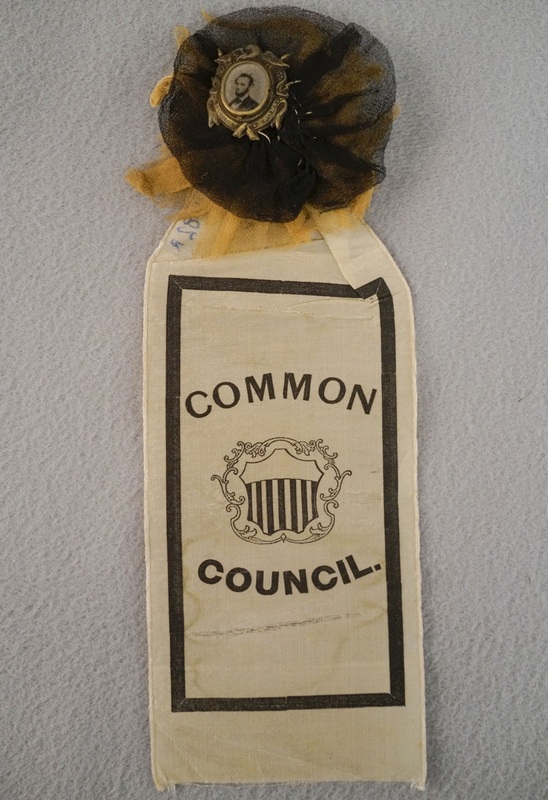 A mourning badge worn by Buffalo Common Council member Henry Swartz at a ceremony in Buffalo's St. James Hall in Shelton Square (close to where the M&T tower is now) after Lincoln's death is part of the display coming to Kleinhans. 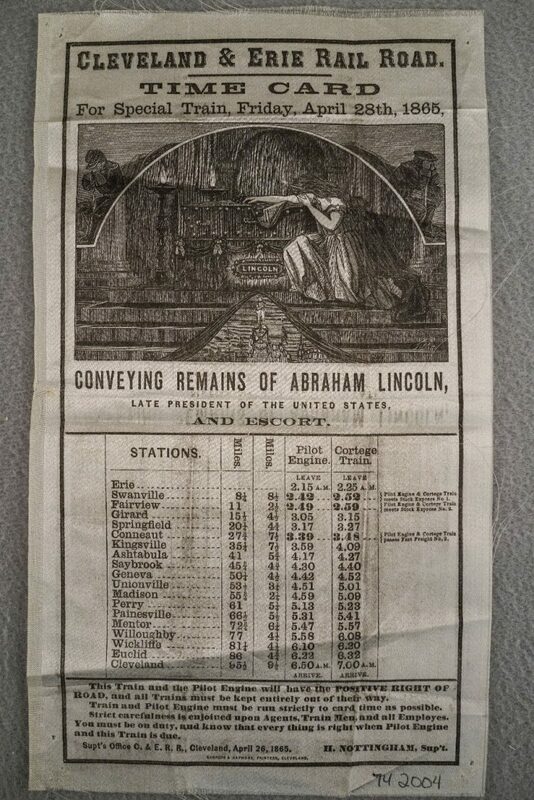 So is a commemorative ribbon that lists the schedule of stops for Lincoln's funeral train between Erie and Cleveland. A drawing of a woman weeping with an arm draped over the casket conveys the solemnity of the occasion. "They say there were 100,000 people who passed by the casket at St. James Hall," Greco said. Among those paying their respects was future president Grover Cleveland. Francis unsuccessfully petitioned Congress in 1873 to make Lincoln's birthday a national holiday. The following year, on Feb. 12, 1874, he began in Buffalo what has become the longest continuous celebration of Lincoln's birthday, with people gathering each year in the museum to mark the date. The museum's best-known Lincoln piece is the bronze statue completed in 1902, mounted on black marble by sculptor Charles H. Niehaus that overlooks Hoyt Lake from the museum's portico. Saunders, a professor at Syracuse University, didn't immediately decide to grapple with Lincoln's long shadow. He had written numerous short stories, essays, novellas and even children's books before beginning what would become "Lincoln in the Bardo," an experimental novel that won the 2017 Man Booker Prize given for books published in the United Kingdom in 2017, an award rarely given to American authors. "I didn't choose Lincoln," Saunders said. "For 20 years I purposely chose not to do this book just because it was Lincoln." George Saunders, author of "Lincoln in the Bardo," considers Abraham Lincoln his favorite president. Saunders will be speaking at Kleinhans Music Hall at 8 p.m. Thursday as part of the Babel literary series. Saunders had heard a story from a family member about how Lincoln visited his son Willie's crypt at Oak Hill Cemetery in Georgetown. The grief-stricken father was said to have held his son's body and was possibly stroking his hair. "It was an interesting story, but I thought Lincoln -- that's too much," Saunders said. "There had been about 35,000 books about him at that point." Saunders let the idea sit. "Then I said, 'Let's forget it's Lincoln and he's just a grieving father, and I know what that's about." The novel deals with Lincoln's grief, with most of the book occurring over the course of a single evening. It is set in "the bardo" – an intermediate space between life and rebirth. "In making art, you do have to go toward the thing that scares you," Saunders said. "That means you will have to find additional powers if you're going to do it. It's kind of like Spider-Man. If he goes against the guy he always beats, it's boring." Saunders said Lincoln remains one of the country's most enduring figures for good reason. "Lincoln embodies certain American virtues we haven't really gotten to the bottom of yet," Saunders said. "He's an intellectual in the truest sense of the word. He's deeply curious about the world and his place in it, and he's willing to self-correct," he said. Saunders, who will be talking about his book and Lincoln with Just Buffalo Literary Center's Artistic Director Barbara Cole on Thursday, thinks of Lincoln as a deeply spiritual leader, too. "At the end of the day, he looked at slavery and understood it to be a monstrous evil against human dignity and had the courage to reverse himself, really, and take the whole country in a different direction," he said.